DISCLAIMER: I’ve got a soft spot for Zakk. When I was 10 the only thing I wanted to be when I grew up was Zakk Wylde. 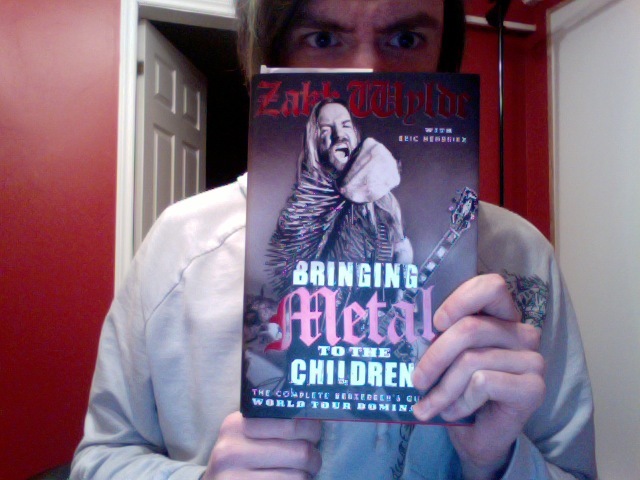 “Bringing Metal to the Children” is definitely not for children. That is unless you don’t mind your kids reading about the girl who shoots Swedish Fish candy out of her wazoo, or the time Ozzy Osbourne smeared his own crap all over the doorhandles and light switches. Come to think of it I’m not sure who the target audience actually is. Current fans probably, definitely not the general public. I’ve got friends who I would never lend this book to, because they’d never speak to me again. All I know is I almost peed my pants a few times throughout. But then my sense of humour is grounds for arrest in some countries. Zakk is nuts, and that’s putting it mildly. The guy drinks so much that Ozzy Osbourne had to send him to rehab (think about that for a second). Take the body of a WWE wrestler, the mind of George Costanza, add some frightening guitar skills and you’ve got Zakk Wylde. The guy’s a walking disaster…who is actually perfect for his job. The book is entertaining. Hilarious road stories, (good) advice for young bands, and first hand insight into the Rock and Roll lifestyle. Admittedly half the time I didn’t know what he was going on about, but it was a fun read. I doubt the book will win Zakk any new fans from the literary community…but who cares? Rock and roll fans will love it.